Here’s the first of several posters about the DINAA project that will be presented at the SAAs this week in Austin. 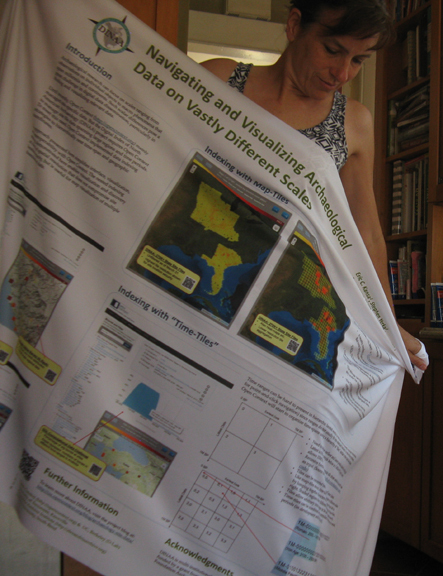 About the Poster: Yes, this poster is printed on fabric. With a tip from a colleague on Twitter, we discovered Spoonflower, a company that prints on fabric. What a result!! The fabric poster is on wrinkle-free material, the colors are accurate, and the printing is as sharp as if it were on paper. The poster folds up to the size of a wallet, so you can literally pack this thing inside a shoe in your luggage. And the best part about it is that it only cost $25 and arrived a week earlier than scheduled. Wow! Here is the blog post with simple instructions on how to make your own. About the Research: The poster’s content is equally as exciting. The DINAA project publishes the most comprehensive record of settlement in North American spanning the Pleistocene through recent historical past. Site definitions and descriptions from project partner SHPOs are used as open government data to form a robust base layer of information. As of the spring 2014, our team has successfully integrated and published records created by state government officials documenting over 270,000 archaeological sites from eight states east of the Mississippi. The data include rich chronological, legal, and environmental metadata used by government officials and the research community alike. The poster discusses the challenges of integrating and visualizing data at vastly different scales—from the scale of continents to the scale of individual object records at a given site. It also presents how the project is dealing with visualizing both space and time, with time as a type of metadata that presents special complications in navigating and visualizing archaeological data.